Trainer Chad Brown has four of the nine entries in this year’s running of the Grade 1, $600,000 Beverly D. Stakes, and his contingency is headlined by the multiple Grade 1 winner Sistercharlie. This 4-year-old filly has been great since moving to Brown’s barn last summer following a solid early career overseas. She enters this event off of a win last time out in the Grade 1 Diana Stakes at Saratoga, where she made a wide rally down the stretch for the victory. The winner of the Beverly D. will receive an automatic position in the Breeders’ Cup Filly and Mare Turf this fall at Churchill Downs. Pre-entry and entry fees will be paid and a nominator award of $10,000 will be given to the person who nominated the foal or racehorse. Also, all Breeders’ Cup starters based outside of the state of Kentucky will receive a travel allowance of $10,000 if based in North America and $40,000 if based internationally. The Grade 1 Beverly D. Stakes shares a card on Saturday with the Grade 1 Arlington Million XXXVI Stakes, which is a “Win and You’re In” for the Breeders’ Cup Longines Turf. The card will also feature other stakes races, including the Grade 1 Secretariat Stakes for 3-year-olds on the turf. The American-based Breeders’ Cup Challenge Series “Win and You’re In” events continue next Saturday with the Grade 1 Pacific Classic and the Grade 1 Del Mar Handicap, both at Del Mar. The Pacific Classic is a “Win and You’re In” for the Breeders’ Cup Classic, while the Del Mar Handicap is a “Win and You’re In” for the Breeders’ Cup Longines Turf. The field from the rail out includes: Daddys Lil Darling, Nyaleti, Sistercharlie, Dona Bruja, Thais, Oh So Terrible, Fourstar Crook, Infelxibility, and Athena. #3 Sistercharlie – This filly has the fastest turn of foot out of any turf female in the country. Since coming to the United States, she has won 2 of 4 and is a head and a neck away from being perfect. She is also a multiple Grade 1 winner, including last time out when she closed with a furious rally to beat Ultra Brat in the Diana. Brown turns her around quickly here (only three weeks off), which means that she is doing very well, and this 9 1/2-furlong distance should suit her perfectly. #7 Fourstar Crook – This sensational New York-bred will look to capture her first Grade 1 win after a couple of strong Grade 2 victories this season. 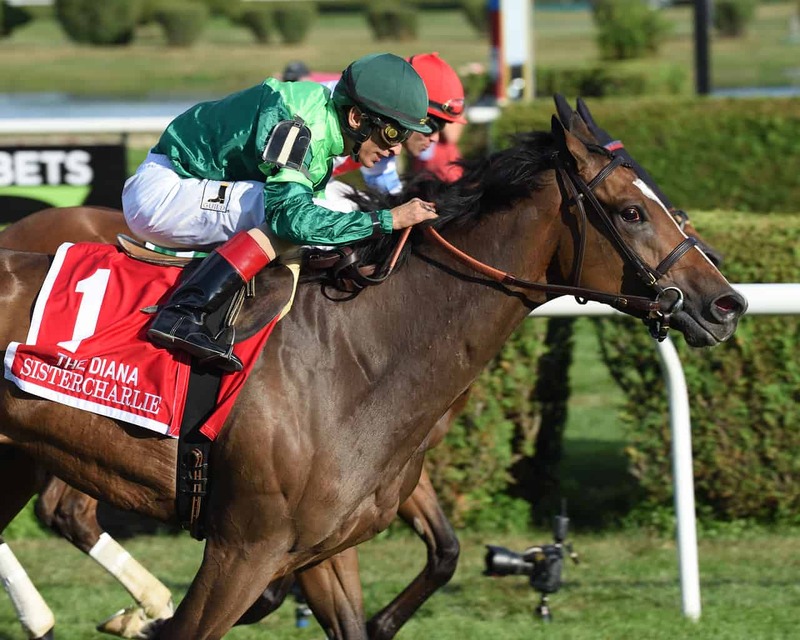 She has won 11 of 17 overall, and last time out, she defeated fellow rivals Sistercharlie and Daddys Lil Darling in the Grade 2 New York Stakes at Belmont Park. She is just one of many New York-bred horses that have shown incredible talent this year, and Brown has her running better than ever. #9 Athena – Clearly, trainer Aidan O’Brien has supreme confidence in this filly, because she’s taking on older horses here in this tough spot. However, he should have confidence, as last time out, she romped in the Grade 1 Belmont Oaks by over 2 lengths. The most amazing part about that win is the fact that she won off of six days’ rest, not to mention the fact that her last race was in Ireland. This very tough filly has to be given complete respect in this spot. #4 Dona Bruja – This mare came to the United States with a flurry last season, winning two stakes in a row before finishing second in this race while losing by only a 1/2-length. This year, however, she is only 1-for-3, with her lone win coming in the Grade 3 Endeavour Stakes at Tampa Bay Downs. We know she likes Arlington, though, having won the Grade 3 Modesty Handicap during her winning streak, so perhaps her short four-month freshening will have her ready to fire a big effort. #1 Daddys Lil Darling – She rounded out her 2017 season with her first Grade 1 victory in the American Oaks at Santa Anita. It looked like that race would set her up for a big 2018, but so far, she is just 4-1-1-1. However, that one victory came last time out over this track in the Grade 3 Modesty Handicap, and she looked sharp in that effort, which could mean that she is rounding into form at the perfect time. #8 Inflexibility – Brown’s other big entries will garner most of the attention, but Inflexibility is no slouch herself. She has finished first or second in all three of her 2018 starts, including a close runner-up effort last time out at Woodbine in the Grade 2 Dance Smartly Stakes. She will be one of the likely pace setters and could take this field a long way if she is left alone on the front end. #2 Nyaleti – She makes her first United States start for trainer Mark Johnston while also taking on older company as a 3-year-old. Two races back, she dominated a German Group 2 race before shipping to Newmarket and finishing fourth in the Group 1 Tattersalls Falmouth Stakes. This competition may be a bit easier for her compared to that last group. #5 Thais – Another Brown entry in this race, she will look to rebound form a poor effort last time out in the $100,000 Perfect Sting Stakes at Belmont Park. This will be her toughest challenge by far, but Brown has been known to win races like this with his “other” entry. Expect her to be close to the pace early. #6 Oh So Terrible – As of late, she has struggled, and this will be her most difficult task yet. Her breeding suggests that she can compete with anyone, so perhaps we have not seen her best yet. Last time out, she was fifth in the Modesty Handicap.